Police at the scene of a murder this year. There is a gang war happening in the territory and Police Commissioner Micheal Matthews said criminals from other jurisdictions are involved. Police also suspect that the recent shootings are connected to a narcotics ring. “Not only that, but we also know that criminals from other territories are gaining access to this territory and committing crimes, and have the ability to arrive and leave very, very quickly,” the top cop said. He said police intelligence also suggests that residents are actively aiding and abetting murderers. He said this intelligence makes it more important for witnesses or other persons with information to come forward. 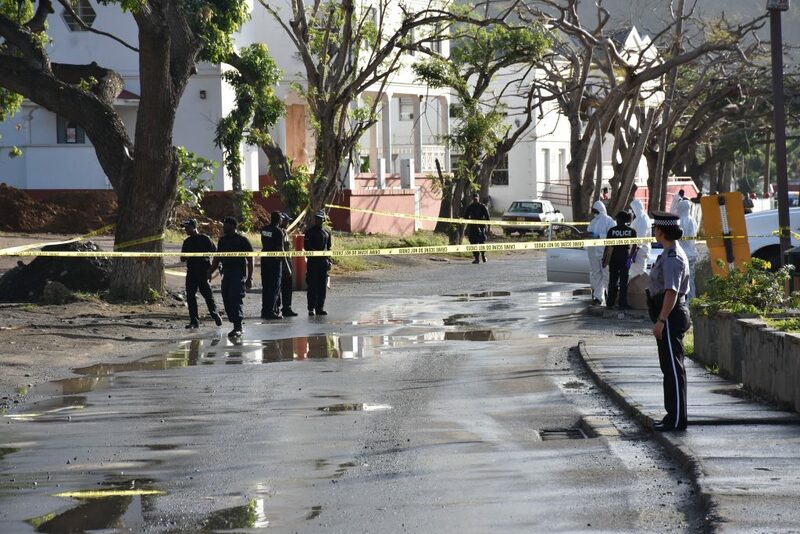 Numerous shootings have been happening on Tortola since the start of the year and three persons already have been killed during these incidents. Persons have also sustained non-fatal gunshot injuries during these shootings. Police said detectives from the United Kingdom are currently in the territory to help solve these murders. Local law enforcement is also rolling out a security plan, which will include a drone surveillance initiative. I hope that if the police know who these friends and family are they are making preparations to arrest them as accessories after the fact. There should no tolerance and no mercy for those who shield killers from justice. 10 years in Balsams Ghut will make them think about the consequences of their actions. My advice to the police is RAID THEIR HIDEOUTS AND SHOOT TO KILL. Who parents and family members vex that is their problem – MAYBE THEN THEY WILL STOP AIDING AND ABETTING THEIR CRIMINAL FAMILY! POLICE FAMILY INCLUDED! Why should anyone vacation there? Every outside criminals/gangbangers know that you can get into Tortola like a piece of cake. To many open and unprotected water way. The drugs, guns and hit men is coming in at nights on speed boats. Depends on what part of the Island you live, late nights you can hear the speed boats speeding like a bat out of H=ll in the dark. Dont worry about my comment. Worry about if i am gathering INTEL on your behinds.Yeah i know hitmen/drugrunners/Gunrunners is commining in by air also. You never know who is watching.Someone is always watching no matter what time it is. Let’s be honest, it’s our fault. We’ve created a culture that permits drug dealing. Why haven’t we extradited those involved in earlier crimes? Are we just a safe haven for drug dealers and their gangs? It would be helpful if you mention where,what part of the island you can hear the speed boats speeding. They come in and out of Sea Cow Bay all the time…I don’t know if they are just enjoying their boats or up to no good, although you do wonder where these young guys find all the money to buy those mega speed boats….just sayin’. Where do young white people find money to buy hundred thousand dollar yachts and houses? So you can point to the industries that are clearly remunerating well and started by or employing young illiterate local kids. No doubt these scumbags probably could turn their talents to something legal and productive but that would take guidance and country that doesn’t stifle opportunity and entrepreneurship. Where is the money printed? And who controls that? Only now you’re figuring this out? Mr.Commissioner are you clearly lost to your surroundings?…one of your colleague 2 sons have been victims of what is currently happening I guess you haven’t have a personal meeting to try and get to what’s really happening. do you need more than this to kick start your investigation??? Why not send in a tip if you know something. Syria? Yes that’s more dangerous. But nobody goes there either. Check out St Croix if you want to see Tortolas future if this continues. Did anyone hear gunshots last night? I have thought for a very long time, that Tortola needs a British army barracks on island. A permanent military presence for security and an opportunity for young men to learn what respect is, and how to earn it. This isn’t the 1980s, and drones can’t do stop and search operations. Why dont people like you stop living in the land of fairy tale are they not armies in England, intelligence organization. Are they not still gangs and murders that are happening not to mention terrorist attacks. Why do we feel that these people have the answers to solve our problems. “East End near Penns”? A bit more information would be helpful as just about everyone in East End is a “Penn”. lmao penn’s is a place my friend. As i said previously we need a couple of fast rib patrol boats to patrol the two approaches from USVI at night. Larger drones watching the channels could direct the boats. Expensive some will say but not as as expensive as letting this tourism and business destroying mass murder continue. We also need am automatic 10 year sentence for being in possession of a gun and 15 years for pointing one at another person. Oh amd legalise and tax marijuana so that we remove the source of income of these thugs. You can put all the ribs and patrols you want! As long as people are corrupt the drugs and guns will come in. A patrolling rib is of no use when there are persons involved in the patrols assisting the criminals. Time to wake up and stop being so f—— naive. In most places in the world that have all the patrols you speak of you can walk the streets and get cocaine or weed anytime and they don’t grow/make them there. How? Obviously if the customs / police is corrupt it is not going to work. Maybe the govt should have the Royal Marine commandos do it for a while. And they’re different how? Can’t you get cocaine, weed and anything else in UK/Europe any day of the week? Don’t they have all the troops, police, Scotland Yard all of that? So…How?????? I am more interested in stopping the guns. Those you cannot easily get in the UK. In the USVI it got so bad that when their local law enforcement personnel became so corrupt the FEDs took over the unit that was so corrupt but yet responsible for investigating the crimes and self. BVI will have to bit the bullet and do the same. it is not a cure all but it curbs the activity a bit. Legalize cannabis and a lot of the gang violence will go away: look at the huge drops in crime in all the US States that have legalized. Marijuana users are different from the gangs of smugglers who use it’s criminalization to flourish. If we actually do get into the medical marijuana business and develop training programmes in supporting fields like agriculture, genetics, solar energy production and RO water production, our young people will be participating in building a future; youth enfranchisement lowers crime as well. Legalization would also change tourism- the culture of those who use marijuana recreationally would take us in a more relaxed direction, encouraging small hotels, beach bars, fine dining and music. Such tourists stay several nights, spending far more money in the islands than drunk day trippers. Don’t argue until you GOOGLE this stuff- particularly Colorado’s experience of drops in violent crime, vastly increased public revenues from taxes and a booming economy. I am with you uncle buck ….lets the UK army comes back and stay with us for at least 5 or 6 months. Criminals are out at night while the police sleep. Legalize ganja and the drug problem goes away.Believe that and I will build a bridge to Anegada! at least you have money for education and more cops to bust coke runners. pot makes people laugh and eat. 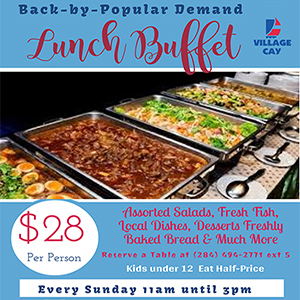 bvi only local manufacturing industry is making meals. booze made in europe and usa-sold here to make people sloppy for a tiny piece of profit. grow the herb and sell through customs who has the only decent institutional security and when expat shows passport, they can buy $100/$50 20/10gm bag upon entry. 10% of visitors buy once and you get 4.5m/year. + you create a branded bvi export and sell to europe and aus as they do right now in med legal P.R. Leave people things alone and stop envy others for material things because you don’t know where they got it. These youngsters watch the shottas movie, listen to some rap, smoke some weed then their big bad men going out and doing foolishness. The people have had enough and street justice has started. Leave people things alone and the little island would be at peace. Simple! Slang ah bunch of narcotics! Den what? Pull up in a new Rarri! Living like John Gotti! Choppin bricks up like Karate Wwhhoaaaa!!! MS! .. He speaks like this is unique to the VI..This is what happens any where in the world, family and friends assist their bad a$$ family and friends!!! Commiss… if you know this is happening why don’t you have measures in place to fix this problem. Many of us have watched TV shows and if these shows are a true reflection of life then family and friends need to be convinced to give up these criminals. Whether by saying they would be implemented in the crime and jail for assisting but who gives up their family and friends without being pushed and pressured. This guy has one foot out the door of responsibility!!! Do your job and stop passing this on ….was this guy really a cop in the UK? I am now scared to go to Springfest in case the gangs bring their feud there…. Come on police, catch them and lock them up for our safety! It is a pity a lot of these criminals don’t have the sense to take out an insurance policy. If you are in a risky business you should protect yourself. The best insurance I could imagine is to write down all you know about who is doing what to whom. Then leave the sealed envelope with a lawyer or a preacher or some upstanding friend who is not involved in the criminal behavior with the instructions that the letter and information enclosed is turned over to the police chief in the case of you meeting a violent end. Let your friends know you have insurance and maybe they will thing twice before shooting you. Just be smart enough to not let anyone know who has your policy. Think of the satisfaction when you are being killed of the justice coming down on your killers. This is not ratting on your friends it is called revenge and it is very fair. Just your way of making sure your killers are not out having fun while you are being eaten by worms. As long as the corrupters are allowed to remain in agencies that are to make laws and see to their enforcement, the dire situation in Tortola and throughout the Caribbean will get worse before it gets better. The drug lords knows that in order to peddle their business without obstruction from the law, is to buy and or pay the law enforcers off. Very highly sophisticated sting operations are needed in the BVI to help weed out the criminal elements that are entrenched in governing bodies on the islands. Police say they have intelligence. They know this and that. Then it simple act on it. Stop playing stupid games. Stop relying on these politicians but they don’t need help. Governor you responsible for Security. Ask for an escalated review of security in the BVI. Let military intelligence monitor and feed local law enforcement data to catch these idiots. If they can do this then someone invading the country for take over can easily do this. It is that serious. Thermal imaging can see what a person has on them. The technology is available to get these fools. They should not be arrested but terminated. Somebody local is hiring these people. The real drug dealers just want quiet and peace to do their business and this thing is bringing heat on them If I was one I would call in a cleaner and start s*^%#^*g this whole gang thug thing down by wiping out both sides and the hired guns to make the place quiet again. Get serious Governor, this is an invasion of the BVI escalate the matter. Stop letting the lawyers go when caught and you could start to solve the issue. Smh. Some of ayo snitching a$$ need go work for the RVIPF instead of coming on the news. Go and work for them since ayo know so much. All ayo want to do is come on the news talk nonsense, talk about people and is some of ayo same brothers, sisters, cousins and family doing the drugs and killings yall complaining about. Police should not let the public know what they planning to to do drones an special forces from the Uk should have never been said keep the suspects out of the loops. But that’s just my opinion. But in the event I am happy to hear that they have a plan to cut the crime. Dont even need CCTV. Satellites can do it.